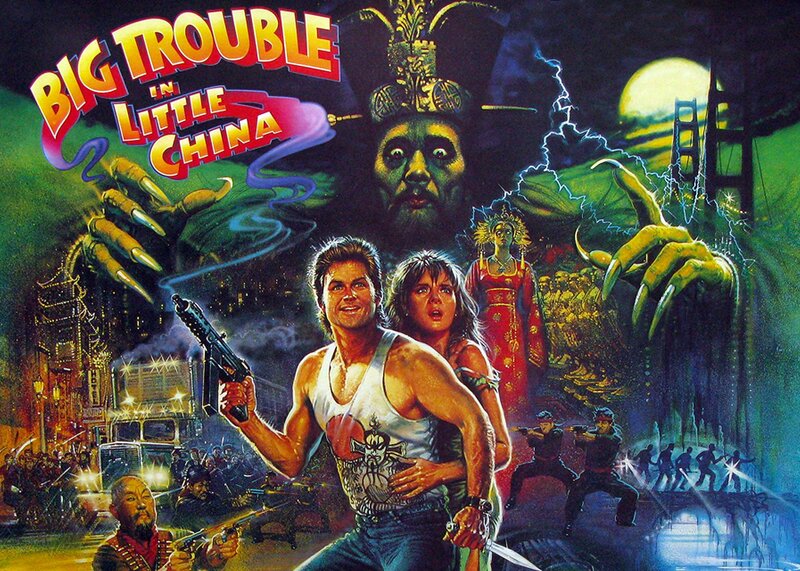 For those who’ve not seen the film, it’s the story of Jack Burton (Kurt Russel), trucker who finds himself in the middle of a triad war, which escalates into kung fu, kidnapping, and supernatural villains from the Qin Dynasty. The film relies heavily on the Mystique of China, the popular belief that all is not what it seems in Chinatown and that something fantastical and bizarre is always going on behind those cheerful lanterns and curtains of glazed ducks. We are told we are in for a story of unbelievable magic, as Egg Shen (played magnificently by the late Victor Wong) tantalizes the audience in the prologue before opening credits even begins. Whilst we are looking at a film which has been created by white, western writers, they draw heavily on the lavish productions of the Shaw studios, and the later Golden Harvest movies, and show their affection for the genre. In the slapstick and tongue-in-cheek tone typical of the film, we see Egg Shen casting bones for divination. Whilst his warnings of ill omens are absolutely ignored by Jack Burton, the dialogue lays out the action of the whole film. The bones he reads look more like pork bones from the restaurant’s kitchen, than the traditional shafts of turtle shells, but it’s a nice nod to ancient Chinese shamanistic rituals. During eras of early Chinese civilization – the Xia and Shang (2070-1520 BC), and to some extent the Zhou and Qin (up to 200 BC), the Chinese placed their faith in their shamans. 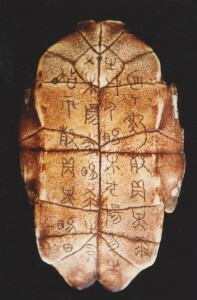 One of the earliest forms of writing was found carved on turtle shells used for divination. Part of the Shaman’s task was to tame the fearful elements, by performing ritualistic dances in their ceremonial masks, gowns and instruments. These became a kind ritual for warding off evil and bringing good luck during all kinds of major occasions. In the film we see the Three Storms, Rain, Thunder and Lightening, performing a kind of ritualistic martial dance akin to the ancient shamans before Lopan’s wedding, it is presented as a kind of magic, having a spell-like effect on Lopan’s brides-to-be. Shen’s readings of the bones come in the form of idioms and enigmatic statements, which along with the patterns in his casting mat resembling the patterns of the I Ching (Book of Change), a work of native Chinese science and philosophy that fascinates the world even today. Egg Shen himself is a modern incarnation of the hermit master, the old, decrepit character who seems like a fool but turns out to be a powerful master. Of course, fans of Chinese cinema will recognize the trope of the hermit master, made famous by the peking opera star Siu Tin Yuen in films like “Drunken Master” and “Snake In the Eagle’s Shadow”. Of course Chinese mix everything up, look what they have to work with. There’s Buddhism, Confucianism, and Taoist alchemy and sorcery. We take what we want and leave the rest. Just like your salad bar. …and we do have a buffet approach to Chinese myths and monsters. Ching Dai and the Three Storms are inspired by China’s wealth of Daoist deities. 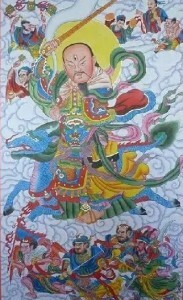 Dong Wang Gong, an embodiment of the sun, is a major deity in the pantheon. And thunder deities play an important part in the Daoist universe. Apart from Lei Zu or Lei Gong, the Grand Thunder, there are nearly 60 thunder deities, kings and guardians and 24 guardians of the cloud and rain who not only help to regulate the elements but also guard the earth and heavens against demons and monsters, keeping the land safe for the people, ensuring good harvests, fertile soils and the general smooth cycle of all things. Even in the statues in the corridors of Lopan’s lair, we can see incarnations of Daoist deities of the underworld, with their human bodies and animal heads. 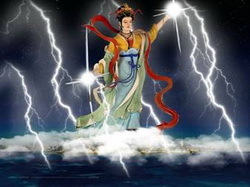 Interestingly the deity who controls Lightening, Lei Mu or Shan Dian Niang Niang, is a woman, commonly referred to as Mother Lightening or Lady Flash, wife to Grand Thunder. However, with our story of damsels in distress, I can understand that having a set of burley evil henchmen for Lopan produces a much greater dramatic impact and comic effect. Of course, the centerpiece to this cinematic chop suey, is David Hong’s demi-demonic Lo Pan. Part Fu Manchu, part Dracula, part wizard, the figure of Lo Pan is shrouded in legend. Wang, the Americanised Chinese sidekick tells Jack that Lo Pan was a warrior and wizard defeated by Qin Shi Huang, the First Emperor, dating it specifically to 272BC. That year was certainly a key point in Chinese history, when the king of Qin, invaded neighboring kingdoms, colluding with some, destabilizing others, until he established his rule as Emperor of the unified nation. No doubt he would have defeated many warriors and mystics. Lo Pan is supposed to have been cursed with having no flesh, a curse he can only break by marrying a girl with green eyes and using her blood to appease the god of the East, Ching Dai. Qin Shi Huang was famous for his insanity in later life, paranoid about assassinations and the usurping of his throne, as descendants of the kingdoms and families he destroyed relentlessly sought their revenge. He increasingly turned to mysticism and thoughts on the body, eventually being buried encased in jade, and suffused with mercury, in an attempt to become immortal. Whilst much of the film elicited laughter at its sellout screening at the Prince Charles Cinema in London this weekend, the film has overall weathered its last 30 years. Elements of the script, which homaged old Republic Serials, seemed dated, but they did so even then, and the humour is never at the expense of the Chinese elements, other than the crass moments when Burton disregards all this Chinese magic malarkey. The elaborate costumes of Lo Pan, Miaoyin and Gracie as brides, and the extravagant giant statues of Chinese demons inlayed with Western skulls, are a perfect combination of 80’s excess and lavish Chinoiserie. “Big Trouble in Little China” is a wholly American film, but the Chinese elements are more than just the Mcguffin. They underlie it, and retain a sort of cinematic truth. Much like America itself, whose Chinese immigrants helped pave the way for the unified continent, working on the Transcontinental Railways (a fact that Egg Shen reminds us of during his guise as a tour bus driver). It’s a film that respected what comes before it, took what had impressed it, and tried to do something new with it, and on the whole, succeeded.